Sir John Soane's Museum comprises his collections and personal effects, acquired between the 1780s and his death in 1837. The collections contain many important works of art and antiquities, architectural drawings, historical volumes, historical architectural models, as well as important examples of furniture and decorative arts. 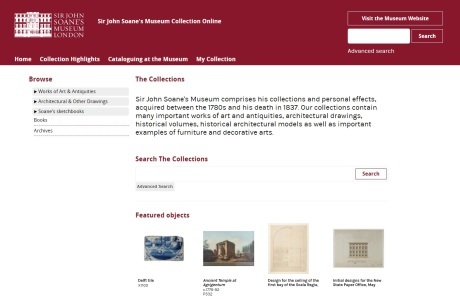 Soane's Museum uses System Simulation's Archive, Books, and Object modules in a combined CollectionsIndex+ application to manage this diverse collection. They have also recently added the Asset module, to manage their collection and corporate images. Selected records are published from the CollectionsIndex+ catalogue to their Collection Online website. This bespoke site, built by us and styled to match the design of the Museum's existing public site, presents works of art & antiquities and architectural drawings in a browseable tree structure. Visitors can drill down in the hierarchy to discover items, as well as being able to perform free text and advanced searches. A highlights page presents a changing selection of items from the collections. The marketing team use CollectionsIndex+ Web Edition, our browser-based collections management system, to upload and manage images of events.